Some of the awesome Sickboys prints from his recent Stay Free Exhibition are now up for sale on the Sickboy's website. "Love Saves The Day" and "Stay Free Print" both pictured above are only £100 each and are both 3 colour prints on 300gsm paper, both signed and numbered. 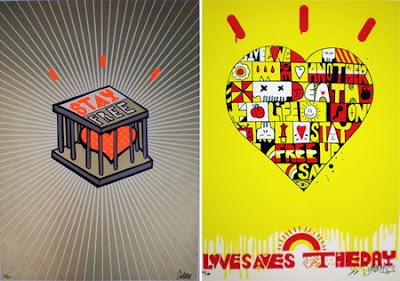 Love Saves The Day is an edition of 100 and Stay Free Print is an edition of 200. Get em now as these will sell out quickly. If you missed the London show, check this video clip put together by Silky. Check over on the Graffoto blog for a great review of the Stay Free Exhibition.